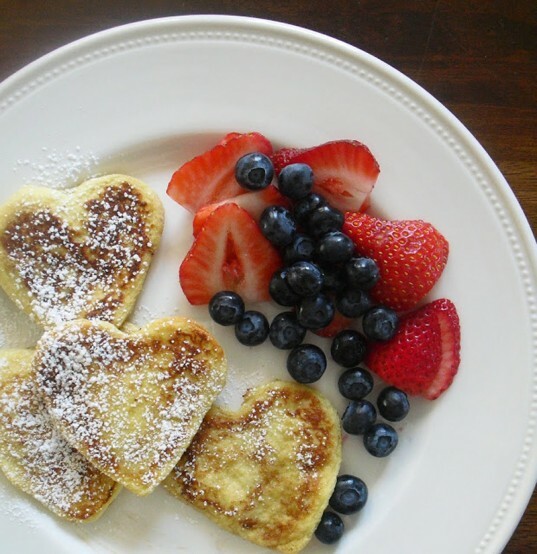 Start Valentine’s Day off with a bang by serving your children a love-inspired breakfast. Whether you choose to shape pancakes, waffles, french toast, toast or even sprinkle granola on top of yogurt in a heart-shaped pattern — it will start the day off right! I really love these heart-shaped pancakes with fruit from A Pretty Cool Life! 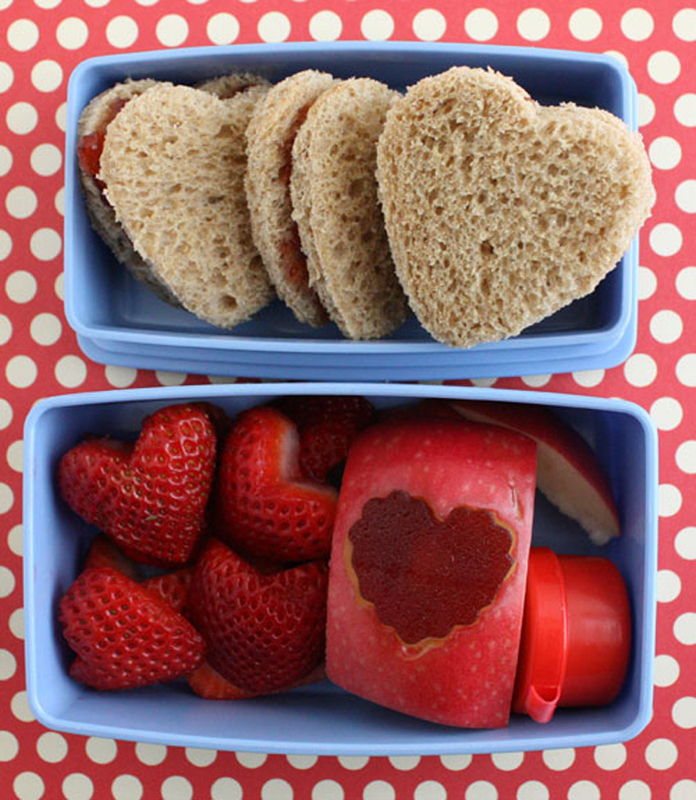 When you pack your child’s lunch and snacks for school on Valentine’s Day, surprise him/her by adding a little love with heart-shaped foods. 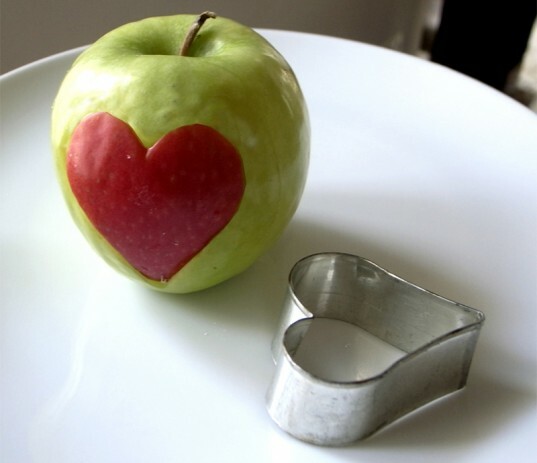 For your child’s morning snack, consider surprising him with a heart inside an apple! If this won’t get your child to eat an apple for snack time, nothing will! And preparing this snack offers double the pleasure because you will have an extra apple left over to pack for your spouse or to enjoy yourself. Lunchtime is just another opportunity to surprise your children with a little love on Valentine’s Day. Fill their thermos full of vegetarian noodle soup with heart-shaped carrots! 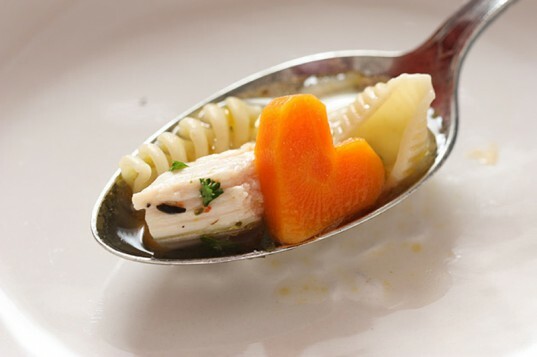 Can you imagine the look of surprise on your child’s face when they start to eat their soup, only to discover sweet little heart-shaped carrots in the broth? And as an added bonus, it will warm the tummy of your little one on a cold February day, too. 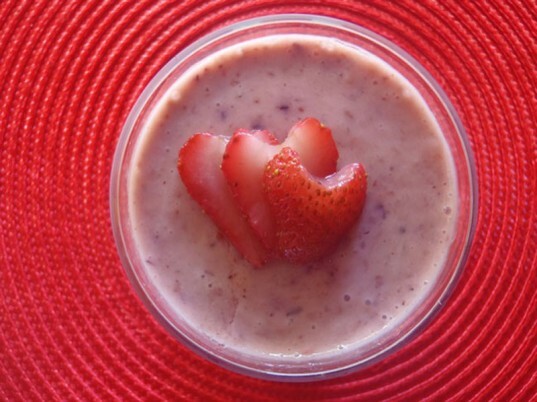 Your little cupids will come home from school hungry for a Valentine’s sweet treat, and what better way to energize them than with a healthy strawberry smoothie? Smoothies are great because you can add all kinds of fruits and vegetables to this yummy snack to fill them with vital nutrients! 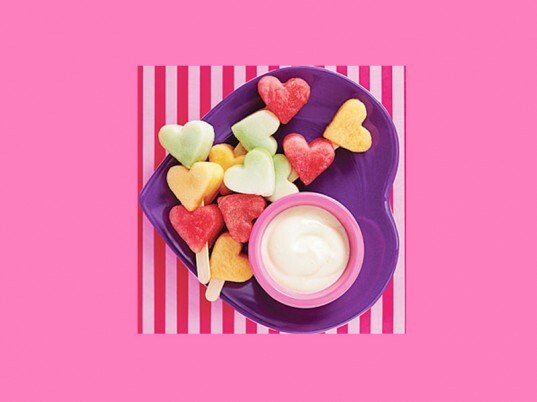 Surprise your kiddos with their favorite fruits cut into heart shapes and served with a side of yogurt or vanilla dip as an appetizer before the big love dinner. And you won’t have to worry about this healthy treat ruining their appetite. Wow your children by continuing your heart theme through to the family dinner. Serve heart-shaped four-cheese ravioli, paired with heart shaped tomatoes! I can’t think of a more comforting, satisfying meal on a cold February night than pasta. If you want to include a fun Valentine’s Day activity after school, wait for your children to get home and make the heart-shaped raviolis together. You can’t forget about Valentine’s Day dessert! 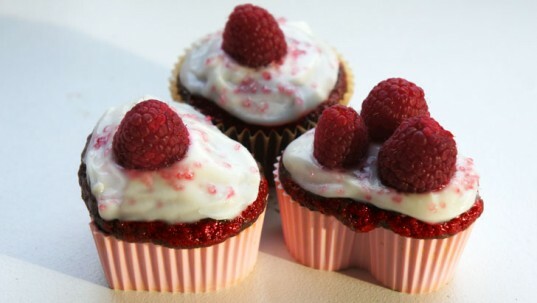 Whip up these decadent and delicious vegan, red velvet cupcakes using silicone heart-shaped cupcake molds! Then top them off with fresh raspberries! Watch Inhabitots’ resident baker Petey make these cupcakes in this super sweet instructional video! We hope you enjoy these sweet heart-shaped foods on Valentine’s Day and every day to celebrate your love! 7 heart-shaped foods kids will love on Valentine's Day & every day! Start Valentine's Day off with a bang by serving your children a love-inspired breakfast. Whether you choose to shape pancakes, waffles, french toast, toast or even sprinkle granola on top of yogurt in a heart-shaped pattern -- it will start the day off right! I really love these heart-shaped pancakes with fruit from A Pretty Cool Life! When you pack your child's lunch and snacks for school on Valentine's Day, surprise him/her by adding a little love with heart-shaped foods. For your child's morning snack, consider surprising him with a heart inside an apple! If this won't get your child to eat an apple for snack time, nothing will! And preparing this snack offers double the pleasure because you will have an extra apple left over to pack for your spouse or to enjoy yourself. Lunchtime is just another opportunity to surprise your children with a little love on Valentine's Day. Fill their thermos full of vegetarian noodle soup with heart-shaped carrots! Can you imagine the look of surprise on your child's face when they start to eat their soup, only to discover sweet little heart-shaped carrots in the broth? And as an added bonus, it will warm the tummy of your little one on a cold February day, too. Your little cupids will come home from school hungry for a Valentine's sweet treat, and what better way to energize them than with a healthy strawberry smoothie? Smoothies are great because you can add all kinds of fruits and vegetables to this yummy snack to fill them with vital nutrients! Surprise your kiddos with their favorite fruits cut into heart shapes and served with a side of yogurt or vanilla dip as an appetizer before the big love dinner. And you won't have to worry about this healthy treat ruining their appetite. Wow your children by continuing your heart theme through to the family dinner. 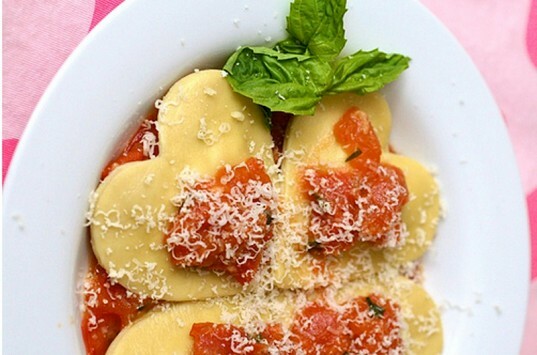 Serve heart-shaped four-cheese ravioli, paired with heart shaped tomatoes! I can't think of a more comforting, satisfying meal on a cold February night than pasta. If you want to include a fun Valentine's Day activity after school, wait for your children to get home and make the heart-shaped raviolis together. You can't forget about Valentine's Day dessert! Whip up these decadent and delicious vegan, red velvet cupcakes using silicone heart-shaped cupcake molds! Then top them off with fresh raspberries! Watch Inhabitots' resident baker Petey make these cupcakes in this super sweet instructional video! We hope you enjoy these sweet heart-shaped foods on Valentine's Day and every day to celebrate your love!